When you file a chapter 7 bankruptcy, you are basically telling creditors that you have no significant assets from which to pay them. To prove this, on your bankruptcy petition you must list all of your property of every nature. You are then allowed to protect or exempt a specific amount of property depending upon which state you live in. Each state has a different dollar amount that can be protected. In the state of Illinois, the amount that you can protect is much less than most other states. Now you might not think that your income tax refund is personal property. But I guarantee you that your chapter 7 trustee will view it as personal property. 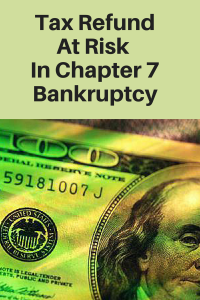 For this reason, you want to time the filing of your chapter 7 bankruptcy accordingly. For example, if you know that you are going to receive a tax refund in excess of $4000, then it would be wise to file your bankruptcy after you have already received and exhausted that refund. If you or your attorney makes the mistake of appearing before the trustee prior to you receiving that refund, the trustee may demand that the money be turned over to him or her. This of course will all depend upon how much property you have in addition to your tax refund and how much can be protected under Illinois law. An individual can protect up to $4000 of miscellaneous personal property when filing a chapter 7 bankruptcy case. When you factor in your household goods, electronics, clothing, money on account at a banking institution, and other personal property, there may not be much room left to protect your tax refund. For this reason, don’t let the tax refund become an issue in your case. Timing is critical for filing bankruptcy during tax refund season. The trustee has an obligation to take whatever non-exempt property is available and provide it on a pro rata share to the creditors. Don’t put the trustee in a position where he or she can take the asset. Also, don’t put the trustee in a position whereby looking away from your asset, he or she is not properly performing the duties of a trustee. Take that potential issue completely out of the equation. In a chapter 13 bankruptcy case, many trustees are now seeking either all or a portion of your tax refund that you receive or are entitled to receive during the duration of your chapter 13 repayment plan. For those individuals and families, I would suggest reducing the amount of your refund each year by adjusting your withholdings accordingly. I would rather see my clients have more money in their pocket throughout the entire year than to be saving it basically and then turning it over to the trustee annually. This is especially true because the amount turned over to the chapter 13 trustee does not necessarily pay down your balance, but rather is additional income added to the creditors share. If you have a large tax refund forthcoming, make sure that you speak with your attorney prior to filing for bankruptcy. I would hate to see anyone lose their income tax refund during a chapter 7 bankruptcy case. It simply doesn’t have to occur if you’re smart about it.